In a large new survey, Tiller Money found that spending less is the top financial resolution for 2018. Spending less money was also the most equally shared resolution between men and women. Men were just 3.8% more likely than women to say it’s their top financial goal for 2018. Women were 27.2 percent more likely to claim this as their biggest 2018 financial goal. No other resolution had such a large difference by gender. 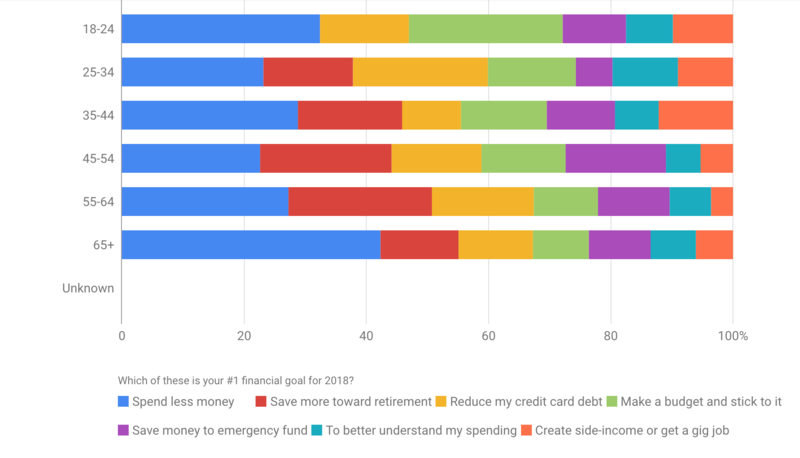 When it comes to 2018 financial resolutions, people aged 18 – 24 and people aged 65+ were most likely to choose “spend less money” as their #1 goal. 32.4% of people 18 – 24 choose this as their goal. People aged 25 – 34 were most likely to want to reduce their credit card debt in 2018. People aged 18-25 were most likely to want to make a budget and stick to it.